The Gingerbread House and Scotch Egg Story. You know you’ve had a successful shopping trip when you return home with a Gingerbread house and a packet of Scotch Eggs. Yes, I’m easily pleased, not for me the finery and luxury of a silk blouse or the exquisite tailoring of an expensive wrap dress. No, just let me wander the aisles of ‘Woodies’ and ‘Homebase’ freely, stopping to gawp at a Winter Carousel, a glowing Snowy Village or a train packed with presents. I’ve said it before and I’ll say it again: I love Christmas! And one of these days when I have the spare cash to squander I will invest in an entire model community of quaint houses, chapels and shops, complete with carollers, captured mid-song. Everything will glisten delightfully with scattered snow and lights will add the final touch . . . Lilliput Lane come to life. 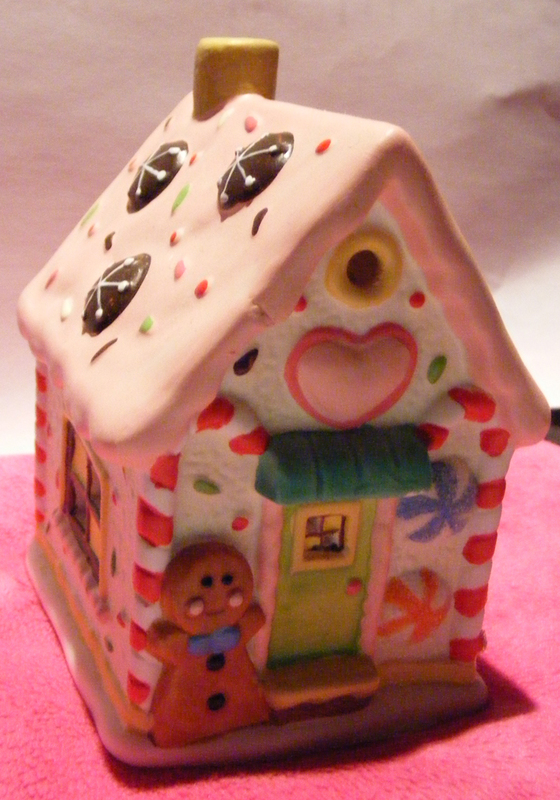 For now though, I must content myself with a modest china Gingerbread house which has yummy looking sweets on it (not edible! ), plus a gingerbread man, plus a Christmas tree. It is cuteness personified and now lives on top of my chest of drawers. Excuse me, while I take a moment to admire it. Yup, still gorgeous, I have taste! And what of the Scotch eggs? Well, they haven’t been eaten yet as I was good and cooked the mince I had left in the fridge. I can promise you they will be savoured though and possibly introduced to a healthy portion of chips. My husband spotted them as we scooted around Tesco, trying not to buy too much as we hadn’t picked up a basket and failing miserably. According to hubs, Scotch Eggs are a very English thing. A quick spot of Internet Research has confirmed that Scotch Eggs originated in London, at Fortnum and Masons. They were a popular carriage snack as they helped to sustain energy levels on a long journey. No wonder Hubs and I are so fond of them! We’re often travelling to Wales and back. Next time, I know just what to put in the rucksack! Meanwhile, I’m going to work out whether a tea light will fit in my new house, settle down with my notepad and wait for inspiration to come! My latest writing project is a series of interlinked stories, set in an small Irish town. I’m loving the links between all the characters and the detail of their individual back stories. At last, I seem to have found a way to write a lengthy piece of work without tearing my hair out! K. S. Moore has just published her first collection of short stories as an ebook, available from Amazon for just £1.99! ‘Heart Strings’ comprises of ten stories, united by their strong, emotional content: the sweet, the magical the romantic and the ghostly . . . Check it out here. Covers, Titles and Christmas Fare . . . I bought myself a little ball decoration of mistletoe, now all i need is some fit handsome men folk to visit! Lilliput Lane come to life! Sounds wonderful! I too enjoy the Christmas season. It was interesting get a glimpse of it “across the pond”. Hope you have a wonderful holiday season!